The First Quarter Moon in your sign on April 12, coincides almost exactly with Jupiter coming to one of its stations. It may be that your working pattern goes through adjustment. All signs may experience a fast and furious cash flow in the first 10 days of April and care will need to be taken not to exceed a budget and to plan carefully for events scheduled for around April 20. It's just after the Sun moves sign that day that it makes its first major aspects to Uranus now travelling through Taurus. This could bring a financial sidewinder your way. It may be that this is property and family connected. Though it's unlikely that a major investment will be made immediately, it key decisions may be taken around this time and just possible that you will move cash around in order to sign a contract before the end of the month. 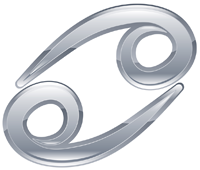 Arguably one of the best days from financial matters for Cancers is April 25. Though it's likely best that any agreement is with someone with whom you've had promising financial partnership in the past. Indeed, it's a long-term interest that could bring best reward.